Working on setting up the blog & creating a watermark for the photos has taken me a little longer than I anticipated, so I apologize if you have already visited. 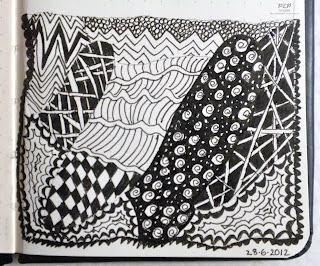 Glenda Waterworth's post in February 2011 was my first encounter with both the term & the art form of Zentangle. I was intrigued & tempted but not at all sure whether to give it a try as I have never been able to doodle but have looked longingly at what others do - I don't draw or sketch naturally either. 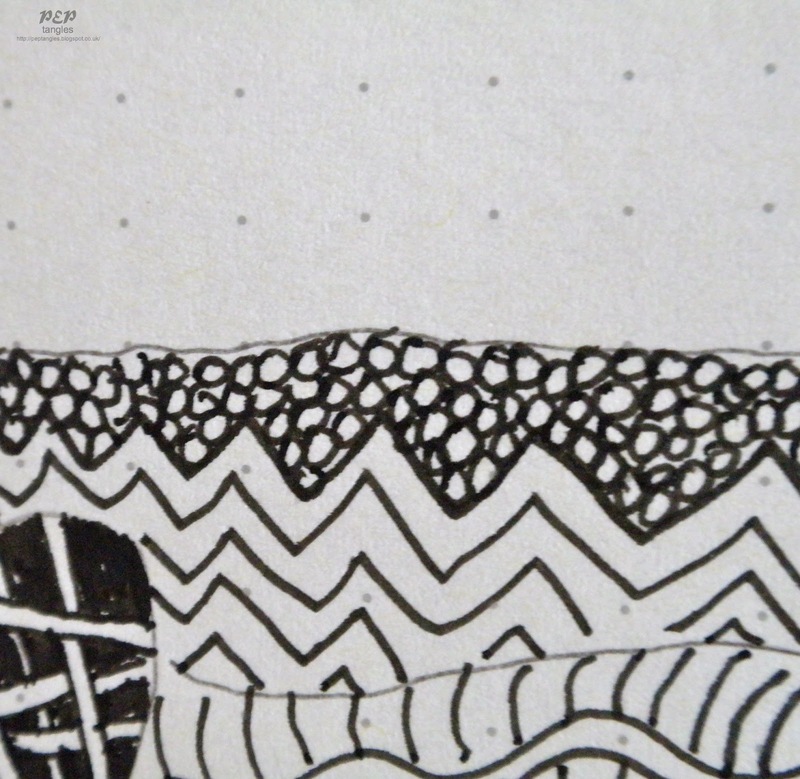 Many know me as a perfectionist & trying to produce a doodle just makes me freeze & ask the question - How? In my mind I dismissed Zentangle as an art form for natural doodlers. During last year I noticed more Zentangle art appearing amongst the blogs I follow (Gina gave some information here & Kathy here, but it wasn't until the weekly Wednesday live chat on the Chocolate Baroque Forum (in which I participate) some weeks back - Glenda explains about that here - when the subject of Zentangle & doodling cropped up again that I had to reconsider my conclusion. 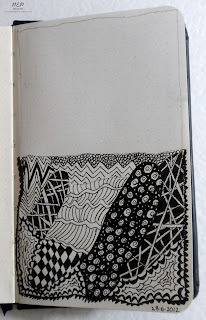 Glenda mentioned that Zentangle is a structured form of doodling & thus a way in to learning how to doodle, additionally she was going to get some pens & books into stock at Chocolate Baroque. 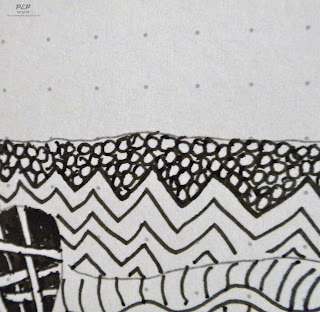 I ordered myself a set of pens & a Basics book & accidentally saw a project in Zentangle 3 involving moveable paper dolls. Those paper dolls have caught my imagination but I want to start with basics & not run before I can walk, & that applies to my desire of shading & colouring Zentangles too. In fact I can see many advantages for me of "tackling" tangling: already I have been well occupied whilst having to resort to bedrest whilst readjusting my migraine medication. A tangle can be done lying down without the danger of my husband finding himself adorned with glitter or gems when he gets into bed, plus my frustration at not being able to craft or move about safely is assuaged. I've always wanted to have a Moleskine - but couldn't think what for - now I have a purpose: an art journal of tangling. 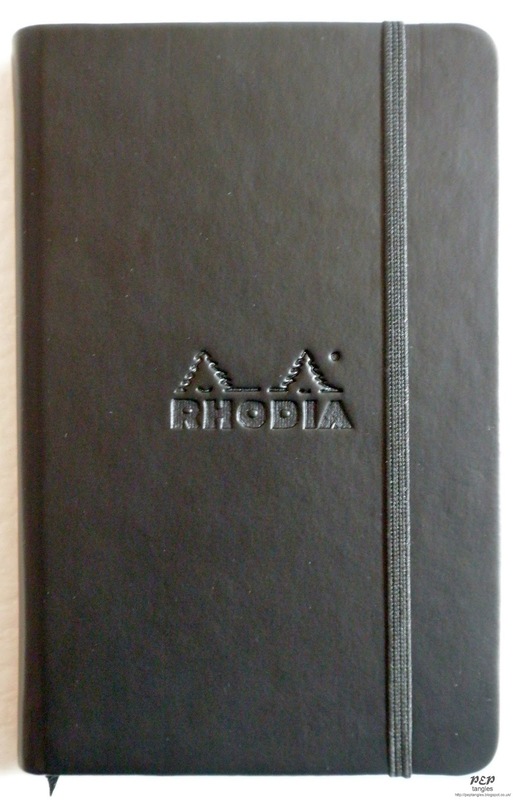 I set about finding myself one & stumbled across several blogs reviewing small journal notebooks (a whole new world in itself) which led me finally to order a little A6 Rhodia Webnotebook. Having seen Sandra Strait's post I decided to opt for the Dot Grid format & I'm absolutely thrilled with my purchase. In fact, after my first tangle in it, I'm so impressed with the quality & construction that I've included photos below (clickable for enlargement). I'm so pleased to see you are getting into the zentangle field and also that you can manage to do them while taking your enforced 'rests'. The book looks impressive and I am off to investigate. I will be folllowing this new blog with interest. What a beautiful book Paula, and I love the grid dots, a brilliant idea. Your Tangled page is super and I think the combination of patterns you have used is very clever. The edging detail really works well. I love your watermark but had to look really closely to spot it. Will have to get the info on how you did it. Wow Paula, that looks great! 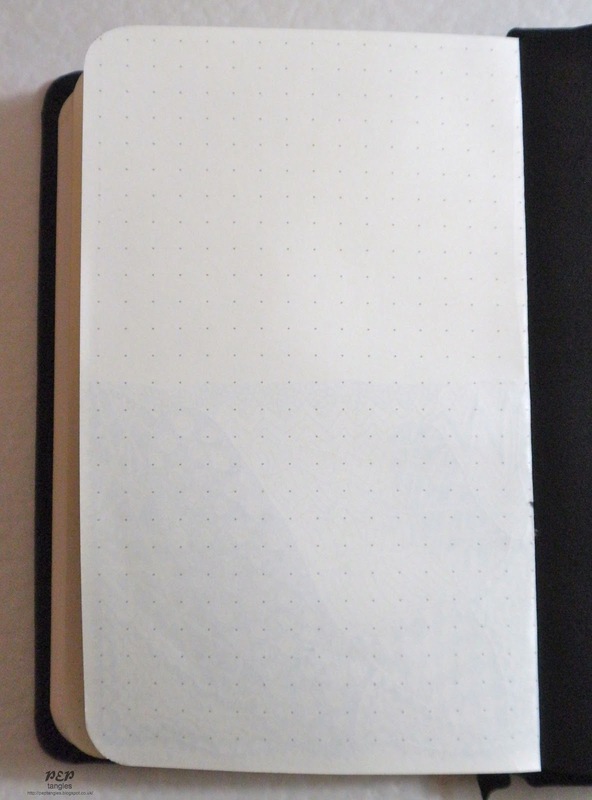 Moleskin books are so expensive and I am very impressed with the non-bleedthrough quality of this Rhodia book as my moleskines do show severe bleedthrough which I found really disappointing. I shall follow your new blog with great interest. I would love to chat to you sometime to gain a little help with adding links and badges to my own blog. Hi Paula, what an extremely impressive post. 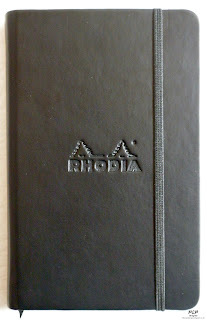 Thank you for including all the interesting links & your review of the Rhodia journal is great. Most importantly, your tangling is terrific. I'm very glad that you're enjoying it & look forward to seeing lots more. Looks like a fabulous book Paula. 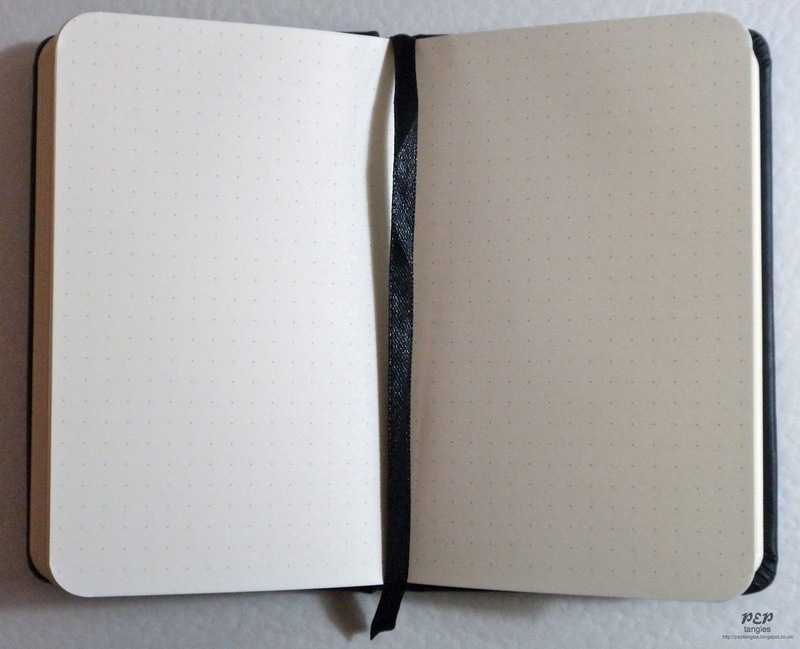 I love moleskin journals, they have a lovely quality to them. Your tangling looks great, and the paper seems to be a very good thickness for the purpose. The dots might be very useful as you go along. I am mesmerized Paula. I am looking forward to seeing more and more of your zens! Fantastic movement in your tangle Paula and love your idea of putting them in the delightful Moleskin. Well this is different! :) I am quite impressed with the diversity and freestyle creativity of this. This is really interesting Paula, cant wait to see how you progress. Very nice! Are you on Facebook? 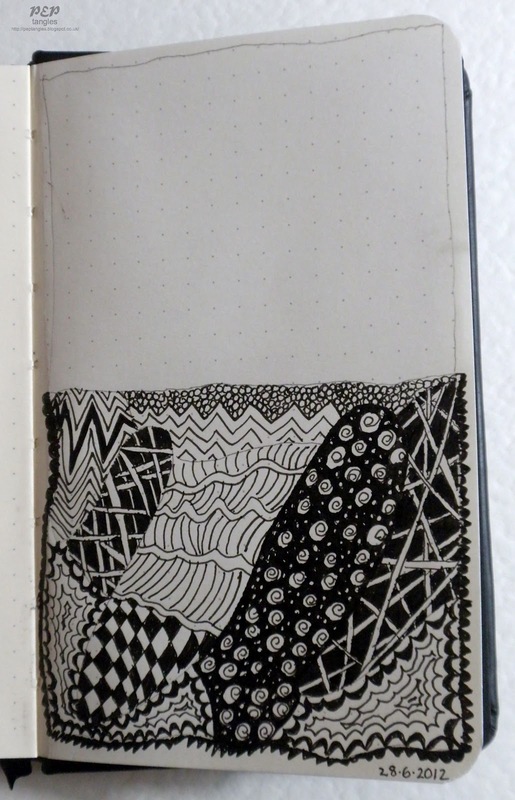 If so, you should Like Rhodia Drive (https://www.facebook.com/pages/Rhodia-Drive/98458096197) and post one or more of your zentangles there. They love seeing what people do with their books. Hi Paula, a great start for your new blog, love the look of that little book. I must not succumb!!! The tangling looks great and hopefully you don't have to spend too much time on bedrest doing it! Those little dots on the page look very helpful!